Moving skyscrapers are tall buildings in which individual floors can rotate on its axis. 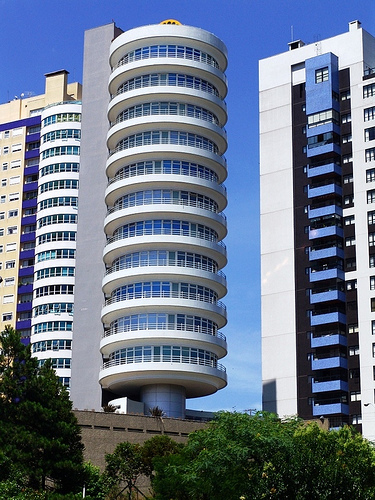 The world's first such building, the Suite Vollard, is a futuristic residential building in Curitiba, Paraná, Brazil. Opened in 2001, the Suite Vollard was constructed by Moro Construções Civis LTDA, and Fritz Georg Gehbauer. The architect was Bruno de Franco. It was built in the Ecoville District in Curitiba, and has since became a famous, well-known building in the city. The floors each have double sheets of glass on the façade, tinted silver, gold, or blue, depending on the floor. This provides "a spectacular effect" as the floors rotate in opposite directions. The bottom floors of the building are mostly an executive center. Each of the 11 floors, comprising the majority of the building, can rotate clockwise or counter-clockwise, with a full revolution of 360 degrees taking an hour. 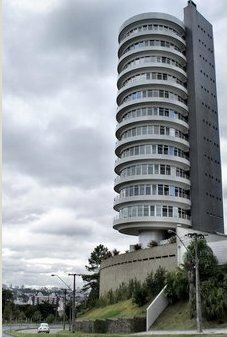 The building was a case study that was used to gather data for more than thirty companies in Brazil, as well as one in Germany. The Suite Vollard apartment complex is named after Pablo Picasso's collection of etchings, the Vollard Suite, which was held on display when the building was inaugurated. The concept of this proposal is to spin a metallic platform rolling over a rigid concrete structure. 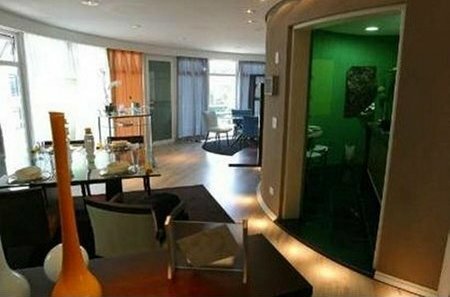 To get the best visual appeal the glass walls rotate together with the platform being visible from outside. The roof can rotate together with the structure depending on the project demands. 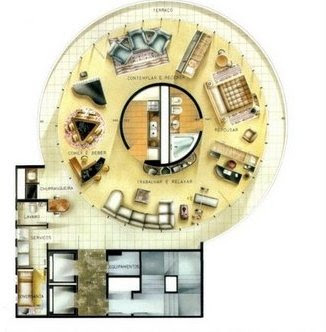 Each apartment can rotate individually in both directions with its own control and timing. The time for one complete turn is according to the needs of the customer. The Suite Vollard completes a turn in one hour. All mobile parts are under the floor with easy access for inspection and maintenance. The concept building Suite Vollard is the first in the world to propose a rotational living space that con be further used as, commercial space or hotel. The generic solution is to revolve a metallic platform around a concrete fixed core. This solution is very versatile and can be adjusted to different sizes, shapes, combinations and applications. For such a project the localization is utmost importance, as the main appeal is the all-around view. Besides the external view, also internally there are amazing possibilities as to position the bedroom, living room or the bar in front of a home cinema fixed in the concrete core. Externally the rotating movement can be persecuted by the different shapes and colors of each floor. Live in a spinning apartment is amazing.